The Celebration of the Humanities is continuing to recognize anniversaries. 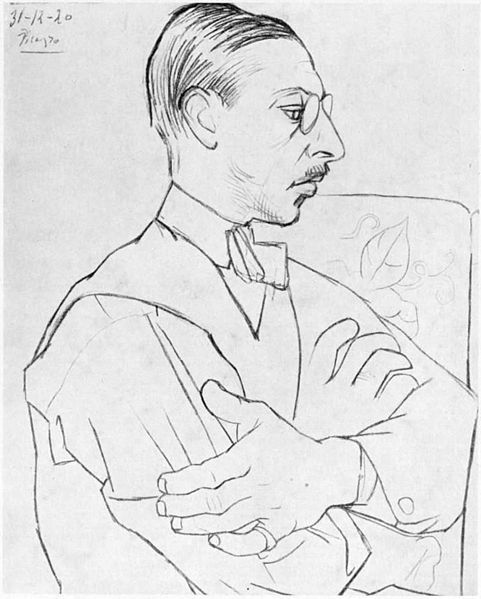 Two of the significant centenaries in 2013 are the New York Armory show and the ballet music for The Rite of Spring by Igor Stravinsky. Both shocked the public in 1913. Why was the public shocked by the art of Van Gogh, Matisse, and Duchamp? Today these artists form the core of our major art museums and fetch outrageous, even monstrous prices in the art market. The visual arts had undergone a change as marked as that of the Renaissance. European artists invented perspective in the 1300’s, but they abandoned it in the 1900’s. Cubism, surrealism, abstraction, expressionism denoted a new way of seeing. “In 1913, the French writer Charles Peguy remarked that ‘the world has changed less since the time of Jesus Christ than it has in the last thirty years ’”—this is the opening sentence of Robert Hughes’s The Shock of the New. The world of sound was not immune from shock. Professor Larry Sisk presented a program on the Rite of Spring today. He stated that Stravinsky’s Rite of Spring is the concert piece that defines the 20th century. But then he showed a video of a re-creation of the 1913 ballet performance which had caused fist fights, cat calls, and public outrage at the Paris premiere. The music and the dance we saw today were enchanting! The ballet that Parisians were accustomed to seeing was high culture: skilled and elegant men and women dancing familiar stories to the romantic music of the 19th century. Stravinsky’s music was choreographed by Nijinsky and he presented flat footed, vaguely folkloristically costumed dancers, in a mostly plot-less procession of maidens and boys with an occasionally grizzled oldster interrupting round dances. What was this? This was the shock of the new. The avant garde applauded; the haute bourgeoisie was outraged. Dissonance, dueling percussionists were unfamiliar in the cultural haunts Paris, London and New York. The startling aspect of the Armory Show and the Rite of Spring ballet is how abruptly the modern age was born. The year 1913 revealed the new vocabulary. The year 1914 was the beginning of the Great War. This turning point will become the core of the Fall 2014 colloquium on violence at Lewis University. The shock of the new will reveal nightmarish novelties. World War I introduced poison gas to war. We are still listening to the Rite of Spring. We are still dealing with the impact of the Great War. Dr. Ewa Bacon is a professor of history at Lewis University. Her areas of expertise include the Holocaust, Auschwitz, concentration camps, Russian history and Central European history (especially Germany and Poland).